Comes with plastic convenient drip tray. Detachable wine glasses hanger and flatware cutlery utensil caddy bin. Simple, contemporary design for any kitchen style. Made of Alumina, sturdy and lightweight construction, non rusting forever. Beyond the Amazon's A-Z claim policy, you are backed by Surpahs' 100% satisfaction guaranteed program, welcome to compare. 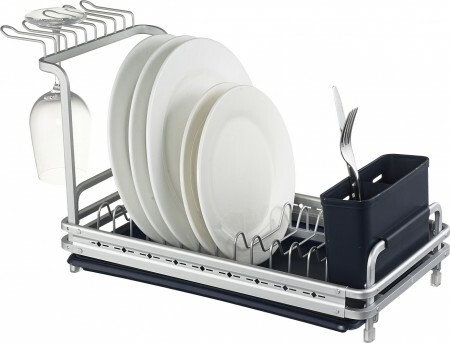 Surpahs Aluminum Compact Dish Drying Rack. Small size dish holder tray perfect for a young couple family. Handles up to 11 full-size plates. Detachable wine glasses hanger and flatware cutlery utensil caddy holder.